StrictThemes has been producing fantastic themes for WordPress since 2013. Their themes are well known for their out of the box commercial features and allows monetized websites to be built up and setup quickly. They have a portfolio of ten themes. The amazing thing is that none of their themes has less than a 4.7 out of 5 rating from customers. A big reason that so many customers love using StrictThemes’ themes is their robust support. They provide months of support for themes and work with the customers to ensure that their themes work properly. Let’s look at these ten themes to see what they offer for businesses. 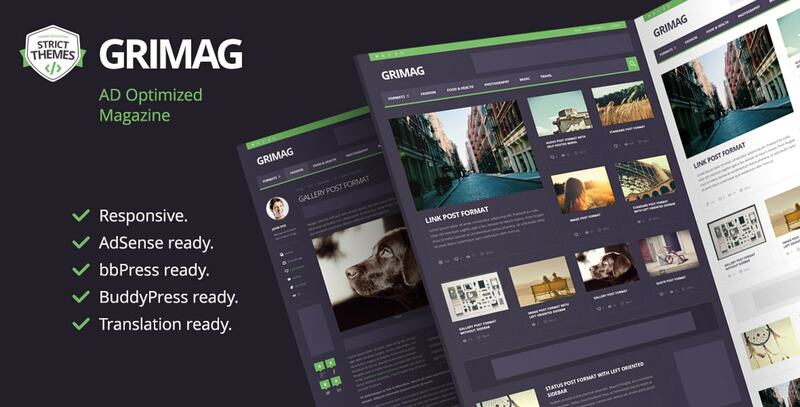 Grimag is the best selling theme by StrictThemes and it is easy to see why. The theme looks beautiful and performs even better. One of its most impressive features is that it has AdSense built into its responsive layout. Many theme makers do not implement AdSense into their responsive design, which causes the designs to break when viewed on a different device. AdSense is the biggest ad platform out there so this is a huge roadblock for companies. Grimag works perfectly with AdSense and ensures that the beautiful layout and functionality is preserved no matter what device or screen size the theme is opened on. The theme has been designed with monetization in mind. It can be fully customized and works well with most plugins. The theme has a very clean layout and has different formats for different types of content. The AdSense placement is perfect as well – it puts all the ads in the most visible locations ensuring the highest number of clicks. Truemag is another theme by StrictThemes that has been fully AdSense optimized to ensure the highest earnings for users. The design of this theme is perfect. It has 4 boxes for important posts right above the top menu of the website. This allows you to easily highlight the most click-worthy parts of your website. The theme has also been built with WooSense in mind and allows you to set up an online store in just minutes. It also has support for the biggest screens and the smallest screens. It uses Retina level graphics to ensure it displays sharp even on the highest resolution screens. The way the theme looks on mobile is great – it doesn’t hide the top 4 boxes, instead it makes them even more enticing to click. 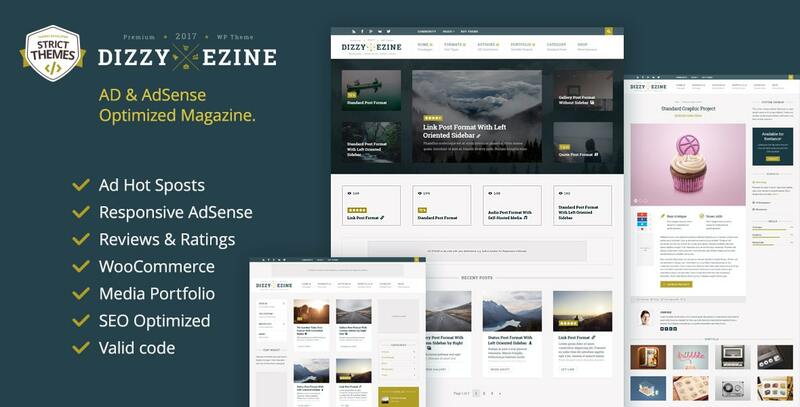 DizzyMag is one of the most stylish themes that StrictThemes has made. We love the layout of the theme. You get 5 posts highlighted on top with pictures. It is perfect if you want to catch the reader’s eye with the hottest storied on the front. It also has responsive AdSense support like most of StrictThemes’ products. The theme also has built in review support which makes it great for affiliated marketing websites. There are two different templates for the front page layout. You can choose the default layout that has 5 sticky posts or you can go with the layout that places the most recent posts in 8 boxes in the middle of the page. This fluidity in design allows you to showcase your content whatever way you want. Are you a multimedia artist who wants to showcase their art? Or just a media publication that wants to focus on the visual aspect? Then Attitude is the perfect theme for you. 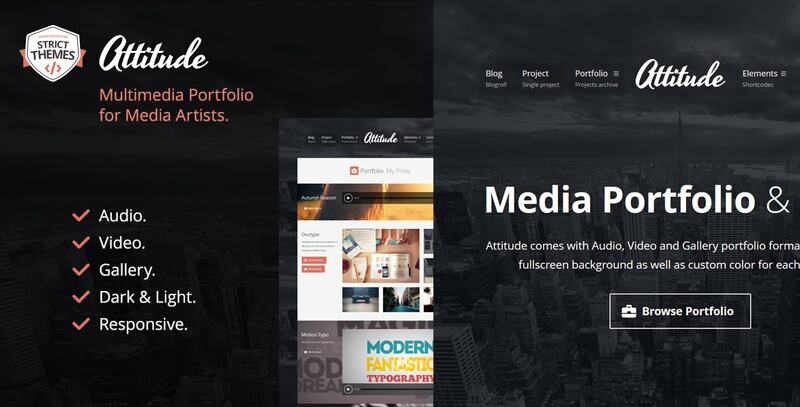 The theme has support for three different types of portfolios: Audio portfolios, Video Portfolios, and Image portfolios. It manages to showcase your creativity and art while at the same time having a fantastic responsive layout that looks great on any screen you view it on. You can also tweak and change the design to your heart’s desire. The theme comes with high resolution graphics – a must for multimedia artists who want to show off their creativity in full resolution. 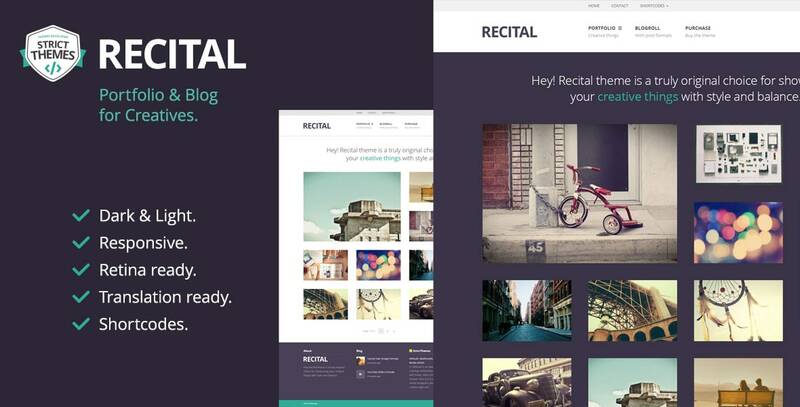 Recital is a StrictThemes theme made by artists for artists. No matter what type of art you are trying to showcase – architecture, fashion, illustrations, digital paintings – they will look beautiful on recital. The layout of this theme’s has been made with creative people in mind and it puts your art above everything else. We also like the fact that the sidebars are completely customizable and you can even create different sidebars for every page on your website. Hovering over any image gives you the post title and subtitle – a great way to show artwork while also showing art details on mouse hover. 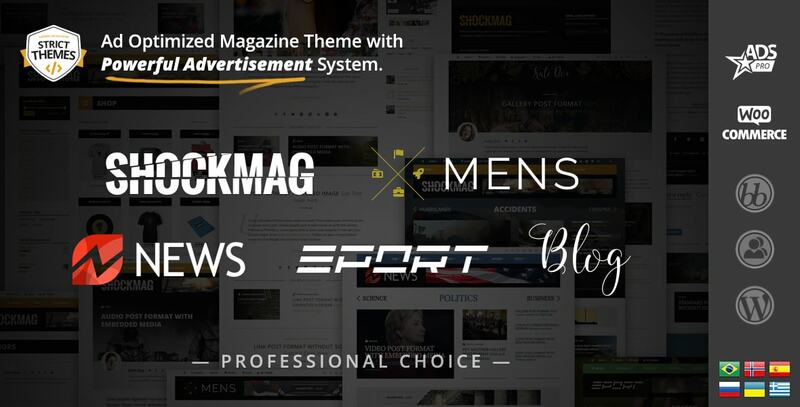 Shockmag is a content centered theme with a design unlike any other. The slider isn’t limited to the slider – it changes the whole website! So if your website has different sections the reader will be able to slide through them and the background page and posts will change accordingly. This dynamic design isn’t something we have seen done this well in any other theme. The theme also comes with ADS Pro for free. ADS Pro is a premium WordPress advertising plugin that allows you to monetize your website easily. You can even create your own mega menus with the recent update of this design. 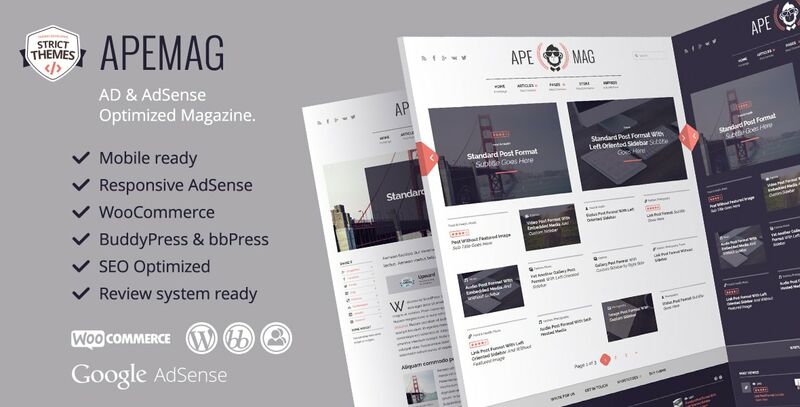 Apemag is the perfect theme for websites that need a review system. Like all StrictThemes’ themes strong emphasis has been put on ensuring that the ads are placed in the best spots for the most efficient monetization. The theme looks great even if your posts do not have a feature image. It is fully responsive but what’s even better is that it is SEO optimized out of the box. Your content will be parsed perfectly by web crawlers and getting into top search results will be easier. We also like the small top menu – it looks very stylish without sacrificing any of the functionality. If you want a theme that truly looks unique then Upward is the theme for you. The whole theme has a leaning motif and it immediately catches the eye. Your visitors will immediately notice how different your website is from every other website they visit and they will remember your website easily. 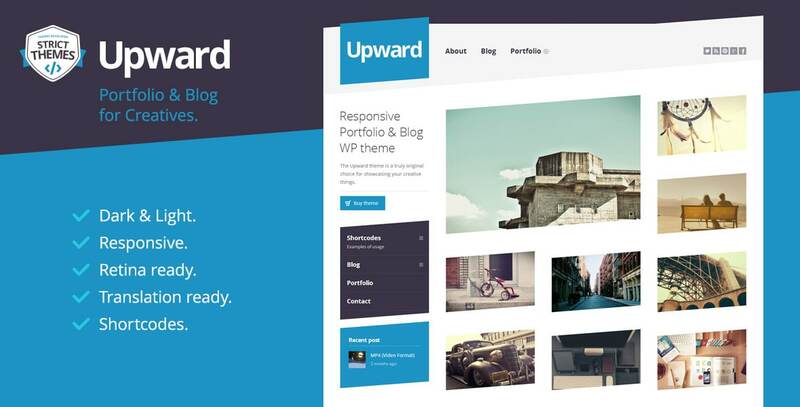 The website has a very clean design and is among the best designed WordPress themes we have seen. The best part is that the leaning motif isn’t lost no matter what device you view the website on. StrictOne is simple in the best way possible. It is very cleanly designed and had a minimalist aesthetic which puts the focus on your content. It has 5 different layouts for the portfolio section which allow you to showcase your talents in whatever manner you think is best. The theme is also fully responsive. You can customize it in any way you want but it comes with 2 color presets, light and dark, and both of them look great. 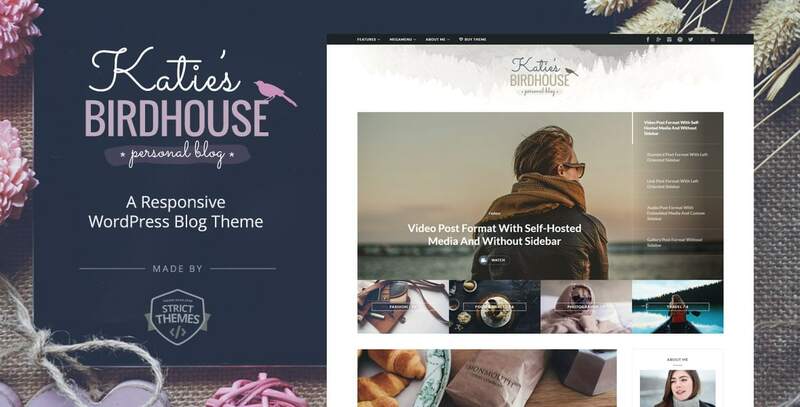 The BirdHouse theme by StrictThemes is perfect for blogs and introspective websites. It has a dreamy artistic aesthetic that goes perfectly with a personal website. It also has different post formats for different types of content allowing you to showcase text posts, video, images, and audio to their full extent. We love the large slider used in this design. 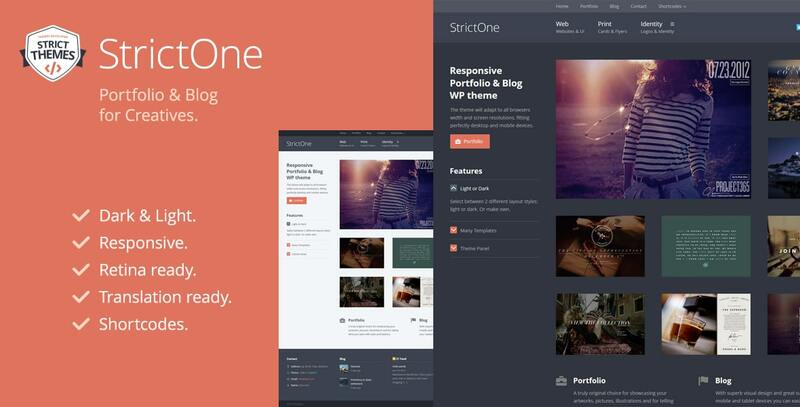 StrictThemes has made a name for itself by making themes that work well. One fact which often goes unappreciated is how well coded these themes are. There are many themes by other companies which work well but are a mess once you look under the hood. We were very pleasantly surprised when we reviewed the code for the themes and found it to be perfectly organize and very readable. This is a big reason why professional developers prefer to work with StrictThemes – they know that if they need to customize anything it will be easy to understand the code and inject their own functionality. We also really like the variations in designs. It ensures that no matter what industry you belong to or what type of website you want to make there is something available for you.